We all remember this recipe from the 80's, don't we? I was going through my recipes the other day and came upon this and thought it was worth revisiting this holiday season. It is actually quite tasty for something very low calorie. I have updated this recipe by adding 4 cloves of garlic and a bit of good parmesan cheese. It really enhances the flavor without altering the calorie count very much. This makes about 20 cups of soup. You can freeze any leftovers. 1 head of cabbage (I prefer to use savoy or napa cabbage, but the regular kind is fine too). Cut veggies into small pieces. Place them in a soup pot with the soup mix and fill with water until the veggies are just covered. Boil on high heat for 10 minutes and then reduce to a simmer and cook until veggies are tender. After cooking, remove pot heat and stir in parmesan cheese. Cut veggies into small pieces. Place them in the crock pot with the soup mix and fill with water until the veggies are just covered. Cook on low for at least 5 hours or until veggies reach desired tenderness. After cooking, turn the crock pot off and stir in the parmesan cheese. I made this yesterday, but before I read your revised recipe. I will have to try your way next time. I love this soup, and it's very filling. Would this be considered low carb? It looks like the only carbs would be from the onion soup mix. Would it still be considered "fat burning" soup if you added beef,Chicken or Vegetable stock/broth instead of Water ? I would suggest just watching the amount of sodium you are adding with the broth. EXCELLENT!! I'd eat this even if I weren't trying to cut calories. So easy with a crockpot. All the work is done with the food processor. Huge return on the labor. Just as good after freezing. Thank you, thank you, thank you!!! Did you use grated or shredded parm? I use grated. It tends to melt better into the soup instead of going to the bottom of the pan. Made it on the stove top last night...big hit!!! What are your thoughts on switching out the green peppers for a different veggie like carrots, or maybe zucchini? They give me terrible heartburn but I didn't know if maybe the green peppers make or break this recipe? Any idea on what the caloric intake would be for this? Are you to only eat this soup for a week - nothing else? What's the rules? 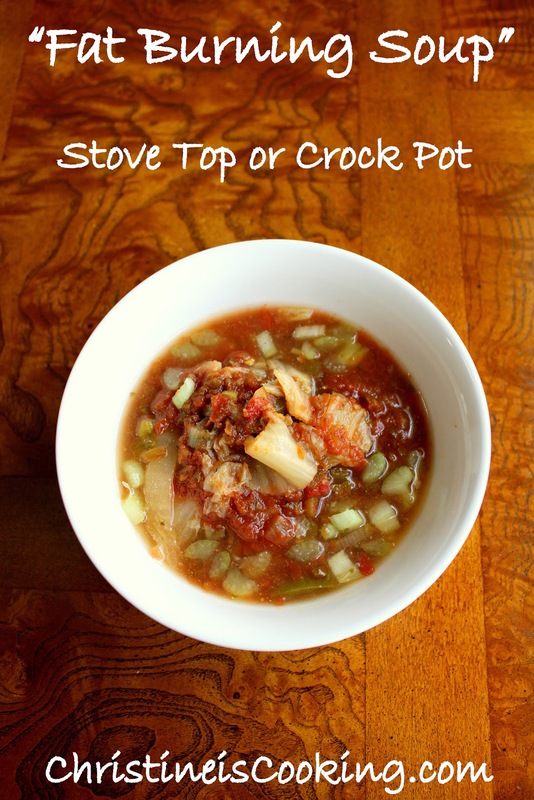 Would you recommend covering the pot of soup while it simmers if you are cooking it on a stove top? I used to make this when I was on Weight Watchers. I've lost the recipe but would love to print your recipe out to keep and try again. There seems to be a glitch not letting me print it. Thanks for your help.